Bajaj has just rolled out its second variant from the platform that was co-developed with the KTM 200 Duke. The first one was the 200NS, of course. The RS200 is the sports version and like the RC 200 has slightly sharper steering, the RS does too. The RS stands for Race Sport which is extremely odd, given Bajaj's marketing campaign which urges the 'Pulsarmaniacs' to 'Leave Track Racing To Amateurs'. What does that mean? Is Bajaj exhorting Pulsar fans, the pros, to eschew track racing in favour of racing on the street? Thankfully, this is the test of the motorcycle not of the genius at the agency who dreamt up this stupid, offensive and blatantly half-baked advertising campaign or the chap at Bajaj who selected it from the stellar bouquet the agency no doubt presented. Actually, if this was the best campaign option presented, I'd actually beg to see the other options on offer. However, it's Race Sport time. 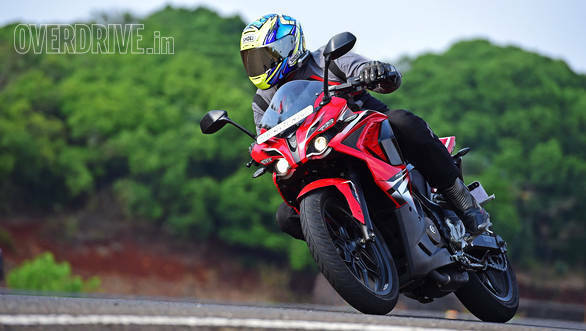 The Bajaj Pulsar RS200 has more styling than all of the Pulsars that have gone before it. 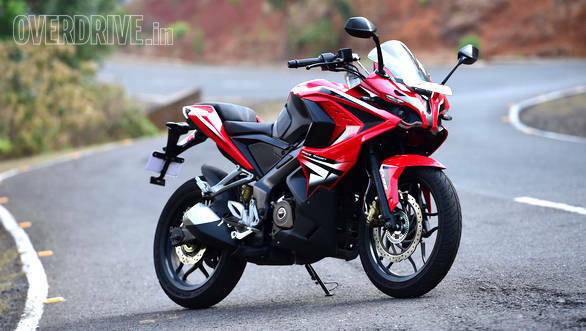 In fact, if OVERDRIVE were in the business of creating meaningless categories at their annual awards to ensure everyone gets one, then the Bajaj Pulsar RS200 would win the Most Style For Money Award this year. And probably for the next few years too. It's over the top and then a bit. The sides are festooned with a galaxy of scoops, strakes, textures, lines, panels and stickering that are hard to grasp. In some ways, it's more like a painter's palette than a painting. If you look closer, there are some details that I do actually like. The side panel with its flat mesh texture I think looks great on its own. The seats too look good. Plus all the silver bits below - peg mounts, levers et al. However, you look closer at your own risk because at the back is a tail lamp that is stunningly at odds with the rest of the bike. There's a good idea in there - to turn the number plate hanger into a light. But the final shape is way too ornate and curvy to go with this design. As you can tell, we aren't fans of this design. However, even we have to admit that the Pulsar RS200 has presence and it does get attention. Second, the appeal of a design is subjective and in a country as large and diverse as ours, there are sure to be people who think the RS200 is a design classic. We've no truck with that and to each his own. Build quality is reasonably good though hard riding through the test had already led to a steady hum from the fairing by the time we wrapped up this test. Finish levels are largely good but like it happened with the Discover 150, the inner panels of the fairing don't quite sit as they're supposed to and you'll see panel gap issues as well as mounting hardware that's finished considerably less than the outer panels. We've discussed the engine in detail in the first ride story so I'm going to skip a full description. The short version is that this engine is similar to the 200NS engine but is fuel injected, produces a bit more power and torque and runs lower final gearing. But it feels like a new engine altogether, I have to say. The metallic edge of the Pulsar engines is gone and the RS200 sounds pretty refined as well as pretty different. The engine makes 24.5PS at 9,750rpm and the 18.6Nm at 8,000rpm. The extra oomph works with the lower gearing to create a motorcycle that's got easy drive off the bottom and is pretty quick after 6,000rpm. The aerodynamic advantage of the fairing combines with the power to push the motorcycle to a higher top speed as well - which is why Bajaj claims this is the fastest Pulsar ever. This is despite a 12kg weight gain over the current 200NS, mind you. Numbers? The RS200 maxes out at 142kmph (this is the GPS-measured speed, not indicated speed) crossing 60kmph in 4.09 seconds (just a smidgen slower than the RC 200) and 100kmph in 9.92 seconds. It's a reasonably quick motorcycle and the linear nature of the torque tends to mask the performance a bit. On our economy runs, the RS200 returned 32.8kmpl in the city but managed 44.9kmpl on the highway for an overall economy of over 35kmpl, which is okay for the segment, in our books. The frame is the pressed steel spar like on the 200NS but the steering is one degree sharper leading to a 5mm drop in wheelbase. This produces startlingly effective results for the motorcycle. Quite unlike its bulky fairing, the RS200 turns really well and corners astonishingly effectively. A lot of previous Pulsars - the 200NS is an exception - worked rather well at street speeds and a bit beyond. But at the limit, they sort of gave up. Then there would be wallow and instability that would prevent any further cornering. The RS200 is, in comparison, a thoroughbred. It has new MRF tyres as well as its own suspension tune (stiffer) that works really well with the sharper geometry. The result is effortless, stable and fast cornering no matter how hard you push. I suspect that the RC 200 would be even more accurate and easy to push harder still, but the RS200 is pretty damn good in its own right. 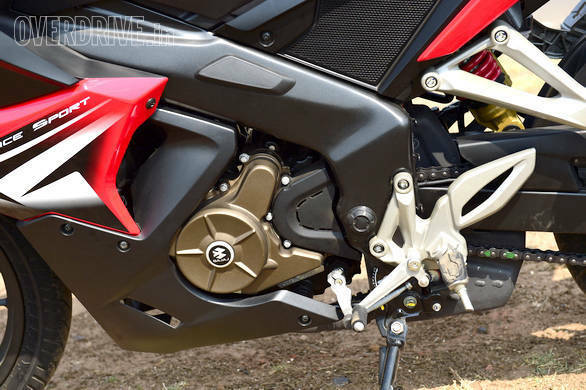 The flip side of the cornering prowess is that the stiffer suspension does give the RS200 a slightly harder ride but again, it isn't anywhere close to being a dealbreaker. The RS200 keeps it eyes firmly on the street and real world riding and the ride quality is good enough. Braking is as expected - friendly with a soft bite followed by enough power. 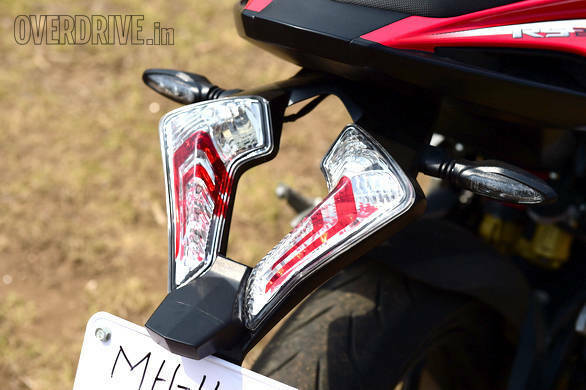 Bajaj are also offering an optional ABS system that only works on the front wheel. This, says the company, should allow more people to be able to afford ABS. Given that most of a motorcycle's brake force is available at the front wheel, this is not a bad gambit. The RS200 is a clever little sportsbike. It does get some of the ability and performance required to be called a sportsbike. But it stays away from dropping the handlebars too low or pushing the legs too far back and high. This ergonomic position is great for cornering and feedback but will kill wrists and cause loads of discomfort. 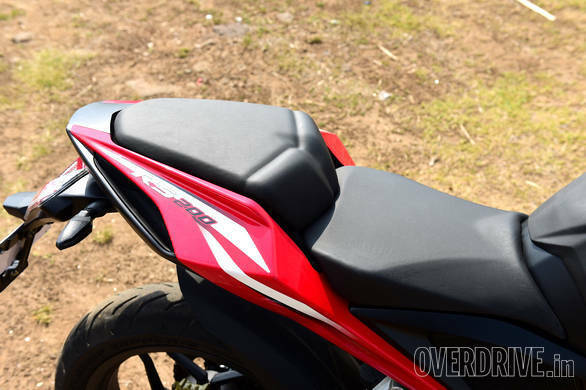 Bajaj have managed to find a riding position that allows you to sit nearly upright if you like and then switch to a full race crouch if amateur hour is over and you're at a racetrack. In that tuck, just watch out for the enormous bar risers - I banged my visor on them more than once. 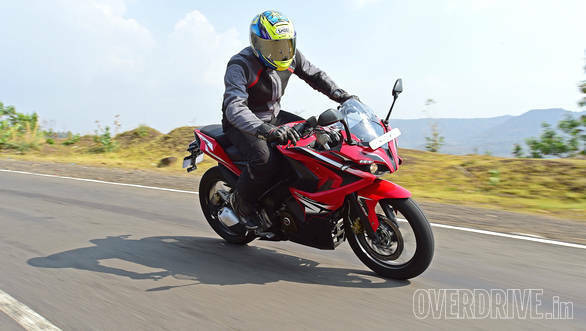 The point is the Bajaj RS200 is an excellent sportsbike for the real world on many fronts. There are purer sportsbike experiences you can buy but this blend of comfort and performance will be hard to find. Bajaj has also priced the motorcycle well. 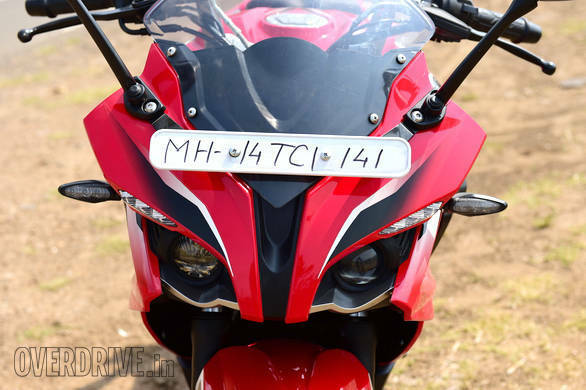 The RS200 is Rs 1.39 lakh on-road Mumbai which makes it Rs 3,000 more than the Yamaha YZF-R15. The ABS model - the one we tested - is priced at Rs 1.51 lakh on-road Mumbai which puts it about Rs 36,000 below the KTM RC200. The only niggle in the package is the design, which you'll have to get used to. And that much plastic bolted on a frame means a lot of potential rattles.